… You also have subtle booths and areas that don’t scream for your attention. You’re just perusing the retro arcade themed hall, looking at all your favourite memories stalled out in the form of nostalgic nineties videos games. All of a sudden your eyes lock on … they get in to focus … your jaw drops! What is this!? That, dear reader happened to me when I stumbled upon the ‘Arcade Joy Stick’ by 8bitdo. This precious little thing right here is to me the embodiment of what the Arcade Hotel is: Gaming housed in mid-century design! 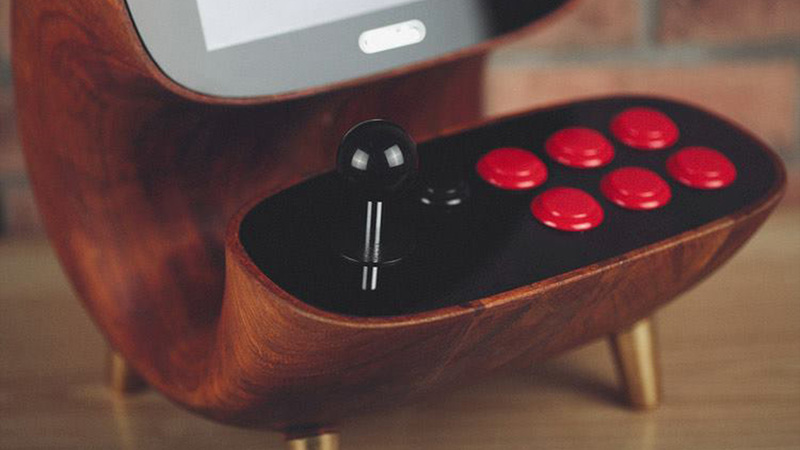 The creators of this small table top arcade cabinet is 8bitdo. The Hong Kong based company’s goal is “Everything Old is New Again’. If you are not familiar with them, they do that by redesigning controllers and fight sticks with NES, Famicom, or a SNES theme. They even have a bluetooth receiver that you can hookup to your NES and SNES, which allows you to play wireless in combination with their or your own current gen controller. This is a prototype of their upcoming product. Melting the joy of arcade gaming together with mid-century design, in the form of walnut exterior resting on brass feet. This is a arcade cabinet that like you has grown up in to an adult with style. One downside, it’s a single player console. So no battles with your friends. As of yet I have no idea, what this system is running on. Do you insert cartridges in the back, is it based on MAME, or built with a Raspberry Pi? Jeez, I don’t know. All I can do is follow the manufacturer’s site and their Facebook page, hoping they’ll keep us posted on when and where this will be available.